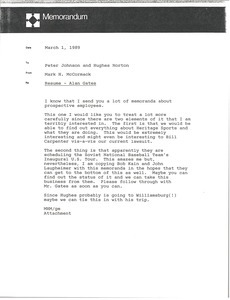 Concerning the attached letter and resume from Alan Gates, a prospective employee who interests McCormack due to his association with Heritage Sports and his scheduling of the Soviet National Baseball Team's inaugural U.S. Tour. 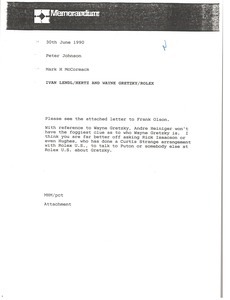 Concerning the attached regarding Buster Douglas. Enclosures not with memorandum. 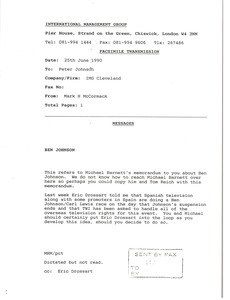 Concerning the attached memorandum from Michael Barnett regarding Ben Johnson, McCormack discusses TWI handling the television rights for an Ben Johnson and Carl Lewis race. 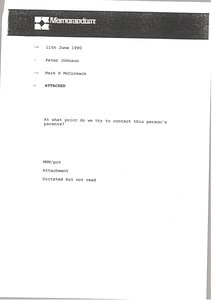 McCormack suggests they put Eric Drossart in the loop about the project. 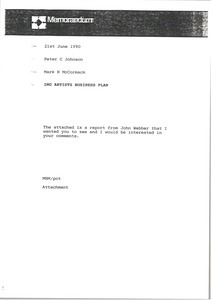 Forwarding a report from John Webber regarding an IMG artists business plan. Enclosure not with letter. Discussing Ivan Lendl's arrangement with Hertz. 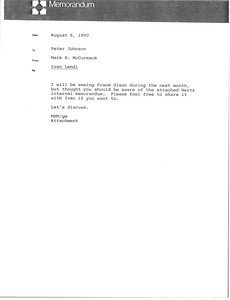 Concerning the attached letter to Frank Olson of the Hertz Corporation, regarding an association between Hertz and Ivan Lendl. 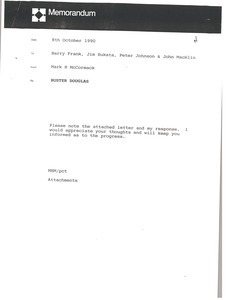 McCormack suggests to Johnson that he talk to someone at Rolex about an association with Wayne Gretzky. 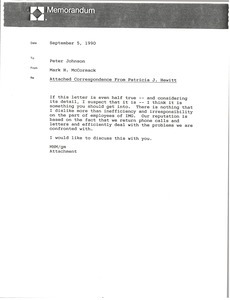 Forwarding correspondence from Patricia J. Hewitt dealing with her unacceptable experiences with IMG. Sending an article and wondering when they should contact Todd Van Poppel's parents. Enclosure not scanned. 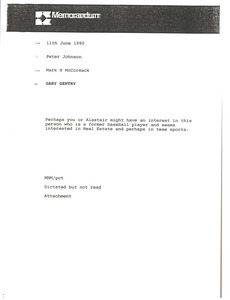 Concerning the attached letter and resume from Gary Gentry, a former baseball player who is interested in real estate and team sports. 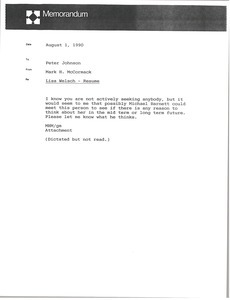 Forwarding the resume of Lisa Welsch.